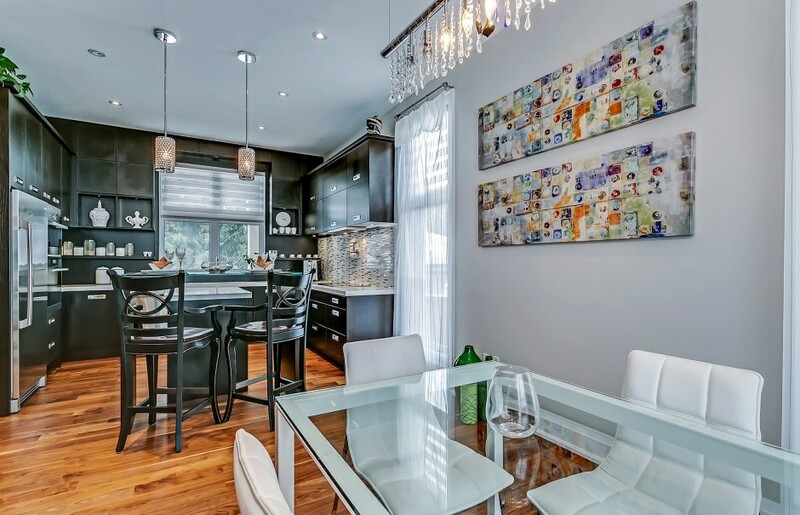 High-end renovation in South West Oakville. This 4 bedroom, 3.2 bath home has been extensively renovated to custom home quality. A tasteful stone & stucco exterior opens through an 8’ solid oak door to the foyer with 10’ ceilings, travertine tile flooring and sightlines to the rear yard through a French door with transom. Symmetrical double coat closets offer ample storage, in addition to the rear mudroom with built-in Walnut cabinetry and charming bench seating. The entire main level of the home is truly open concept, centered around the floating walnut staircase with rod iron railings and oversized Austrian crystal chandelier. A linear gas fireplace with ceramic tile surround is the focal point of the great room and dining room. Built-in floating Walnut cabinetry ties in with the Walnut hardwood flooring, adding warmth to the sleek, minimalist space. Mini halogen pot lighting and multiple full-height casement windows with transoms allow for plenty of light. The entire home is dressed with custom Hunter Douglas silhouette blinds. The gourmet eat-in kitchen boasts the highest-end stainless steel appliances, including Miele double wall ovens with steam feature, and an Electrolux 5-burner induction cook-top. A stone subway tile backsplash compliments the Caesarstone countertops and dark-stained soft-close cabinetry. The two-tiered central island with bar seating and Austrian crystal pendent lighting opens to a sunny breakfast area with Austrian crystal chandelier. The Walnut hardwood flooring continues upstairs, into the master retreat with gas fireplace with marble surround, and French door walkout to a romantic covered terrace overlooking the rear yard. A European style built-in vanity and walk-in closet open to the five-piece ensuite with heated stone tile flooring and floating vanity with seamless lacquered cabinetry and Quartz countertop with His & Hers under-mount sinks. Additional luxury elements include the standalone Azzura soaker tub, walk-in steam shower, and heated towel rack. 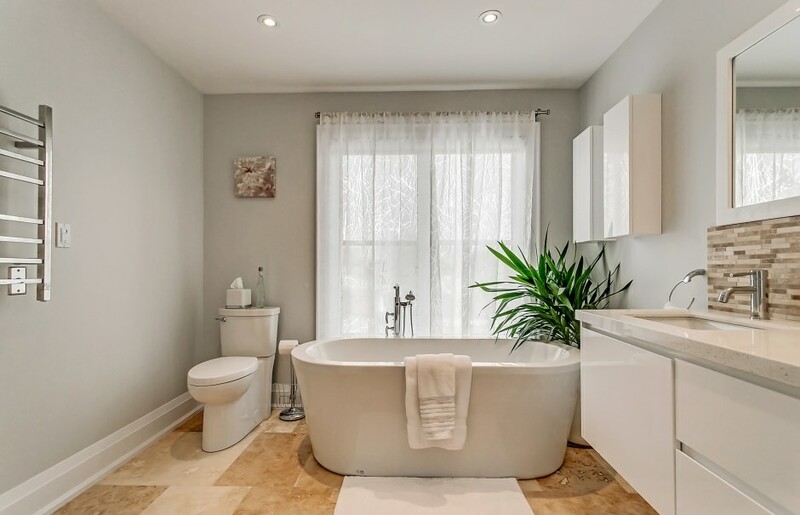 An equally lavish main three-piece bathroom services two additional bedrooms with walnut hardwood flooring and mini halogen pot lighting, with the fourth bedroom enjoying its own four-piece ensuite. The lower level, with oversized windows, offers an expansive recreation and games room, bright office, elegant secondary powder room, laundry room, and pantry. The 140’ deep lot with private rear yard offers ample space to entertain, with a partially covered two-tiered deck and additional partially covered patio with central chandelier and trellis. Interior or exterior, no detail has been overlooked, from the security system with Apple remote video surveillance, to the patterned concrete driveway. 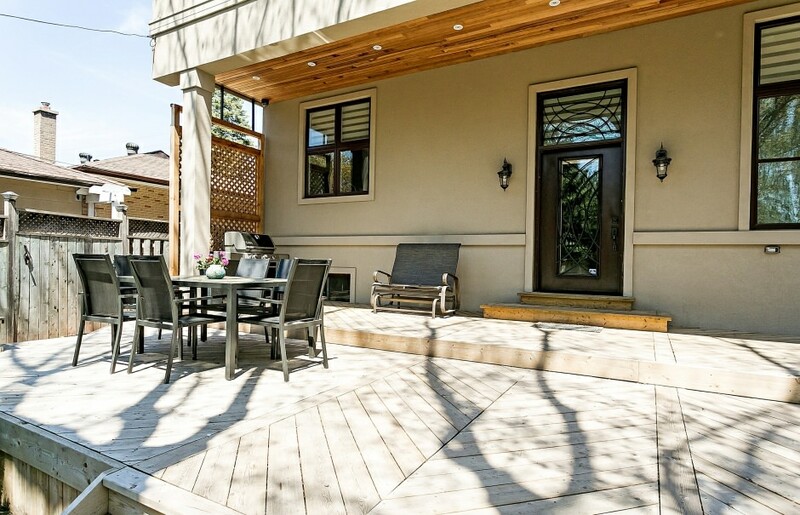 Quality in workmanship and design characterizes this fabulous family home in popular South West Oakville.